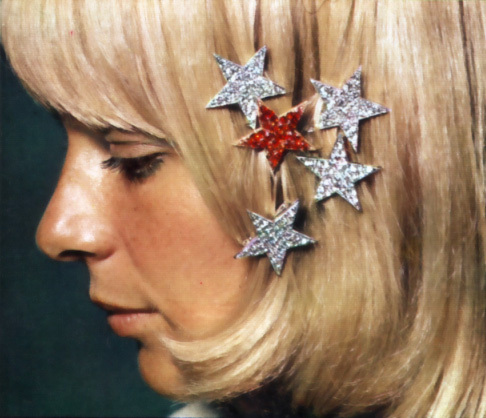 Here's an all-France Gall mix, featuring some of my favourite songs of hers from 1963 to 1972. I say some of because, well, I love pretty much all her stuff from that era - it took some restraint to only choose 38 songs! You'll find some of her absolute classics here, as well as some lesser-known songs that are equally wonderful. After making the mix, I realised I drew a lot from my favourite album of hers, the 1967 psych-pop classic, 1968. I also seem to have included every song where she does her adorable version of scatting, which is really just the best thing ever. As well as her French songs, I've included a few of her German tracks, the Japanese version of 'Un prince charmant' and the Italian version of 'La Quatrième Chose'. I've already gone into what I love about France Gall's music, so I'm not going to get descriptive here, but just let the music speak for itself. My hope is these selections would make someone new to her music fall in love with it as much as I did. And perhaps there are a few things here that are not so readily familiar to established French pop fans. Continue reading "chansons pour que tu l'aimes un peu"
Fans of the peculiar charms of French-born songstress and actress Claudine Longet may know the beguiling 'Electric Moon' from her 1971 album, We've Only Just Begun. The song was written by Donovan – whose brilliance and versatility as a songwriter tends to be seriously underrated, in my opinion – and produced and arranged by Nick DeCaro. Assigned by A&M Records to work on Longet's music in 1966, DeCaro was the chief architect behind her brand of lush easy-listening, arranging and/or producing seven of her eight albums (including 1974's Sugar Me, which remained unissued until 1993). Andy Williams, Longet's then-husband, liked DeCaro's work so much, he hired him to work on his own records. Longet also released a Spanish language cover of 'Electric Moon' as 'Como la luna'. She appeared on a show called Estudio Abertio on Spain's TVE around early October 1971, performing this and the B-side 'Mucho tiempo mas', a cover of Linda Ronstadt's 'Long, Long Time'. Donovan never released a version himself but, according to this EIL listing, did record a demo acetate for Longet. The only recording of Donovan performing the song to have surfaced is in a 1970 film called There Is An Ocean, which was unreleased until its inclusion in the 2005 box set, To Try For The Sun. Continue reading "electric moon upon the water"
Most fans of France's early work write her off after the 60s, but, as I've mentioned before, there are a few surprisingly good tracks among her early 70s output. I think I've heard a couple I don't mind from 73, but generally she loses me after 72. The best from 70-72 are the outstanding bossa nova track 'Zozoï' and the two Gainsbourg-penned songs, 'Frankenstein' and 'Les Petits Ballons'. All nicely show France has grown from the jazzy ye-ye girl to a softer, more mellow style, with her sweet voice still in tact. (The above pics are not the best indicators of that, coming from a German magazine where her work at this time was far more kitsch!). It's after this that her voice adopts that cookie-cutter AM radio vibrato and her material becomes sappy soft pop that holds little interest for those who loved the bite in her earlier work. 'Cinq Minutes D'Amour' is an interesting transitional song - it's clearly already in 70s soft rock, AM radio-friendly territory, but has enough pleasing qualities to save it. Her vocals retain that naturalness that she loses later. Continue reading "ça suffit pour changer la vie"